3 The Child and the World! There is nothing more wonderful to watch than a small child, 2 or 3 years old, speaking to its mother, holding a conversation with its mother. It does seem miraculous, as many have said, that in such a short period a child can reach so far in its use of this most precious of human possessions, language. 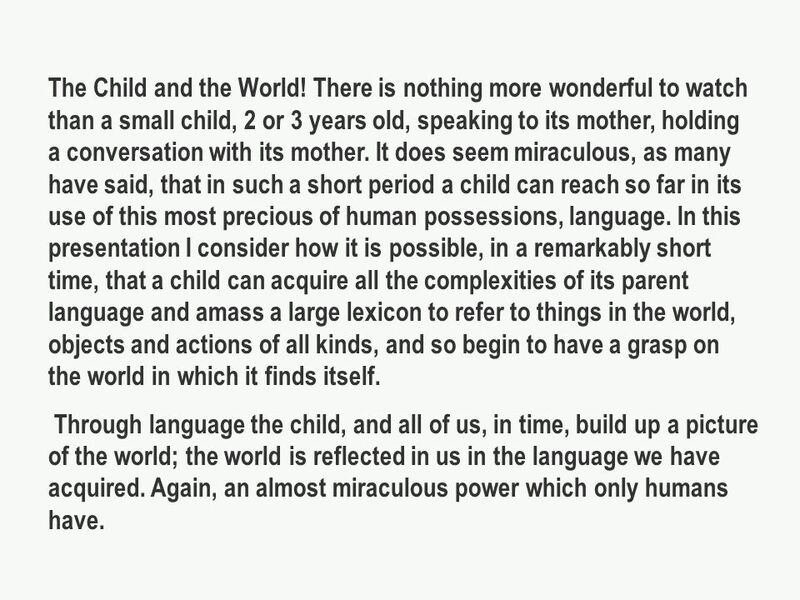 In this presentation I consider how it is possible, in a remarkably short time, that a child can acquire all the complexities of its parent language and amass a large lexicon to refer to things in the world, objects and actions of all kinds, and so begin to have a grasp on the world in which it finds itself. Through language the child, and all of us, in time, build up a picture of the world; the world is reflected in us in the language we have acquired. Again, an almost miraculous power which only humans have. 4 HOW CHILDREN ACQUIRE LANGUAGE You are a very young child. : you have to discover the internal structure of a system that contains tens of thousands of units, which can assembled in an infinite number of combinations. But only one of those infinite combinations is correct. 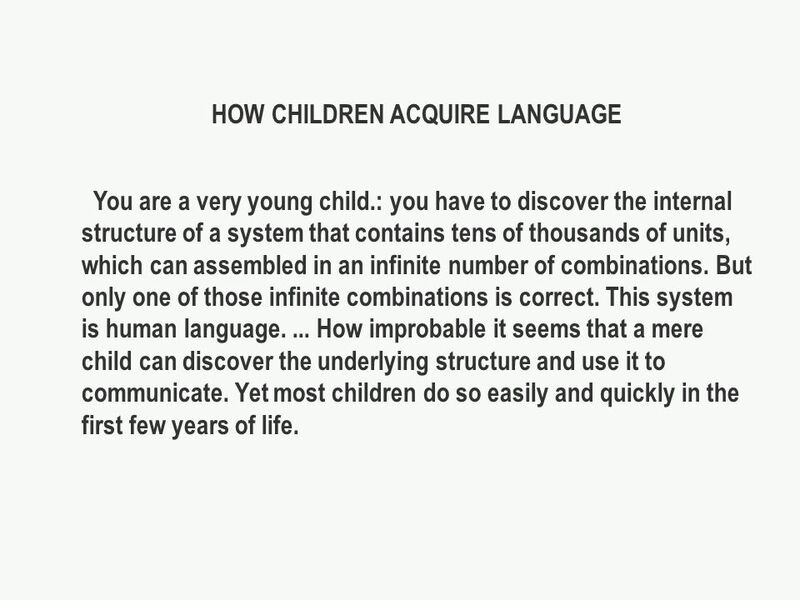 This system is human language.... How improbable it seems that a mere child can discover the underlying structure and use it to communicate. Yet most children do so easily and quickly in the first few years of life. 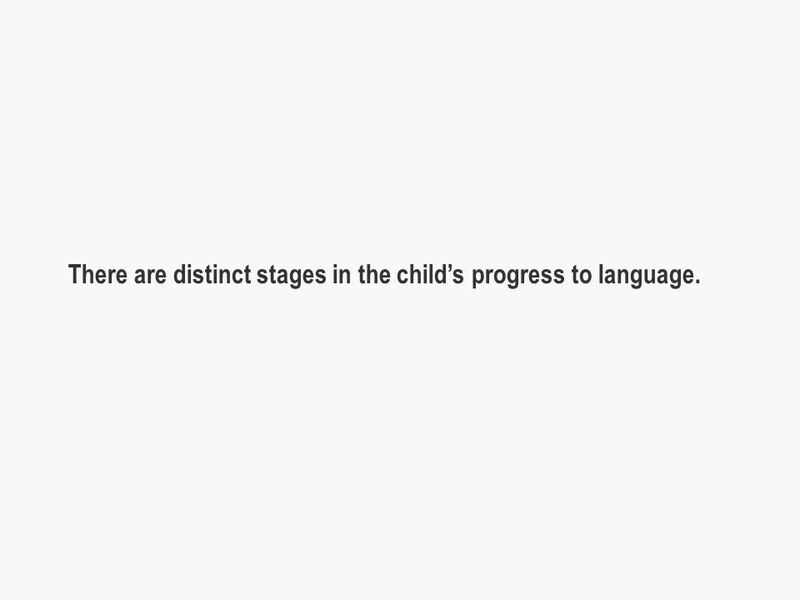 5 There are distinct stages in the childs progress to language. 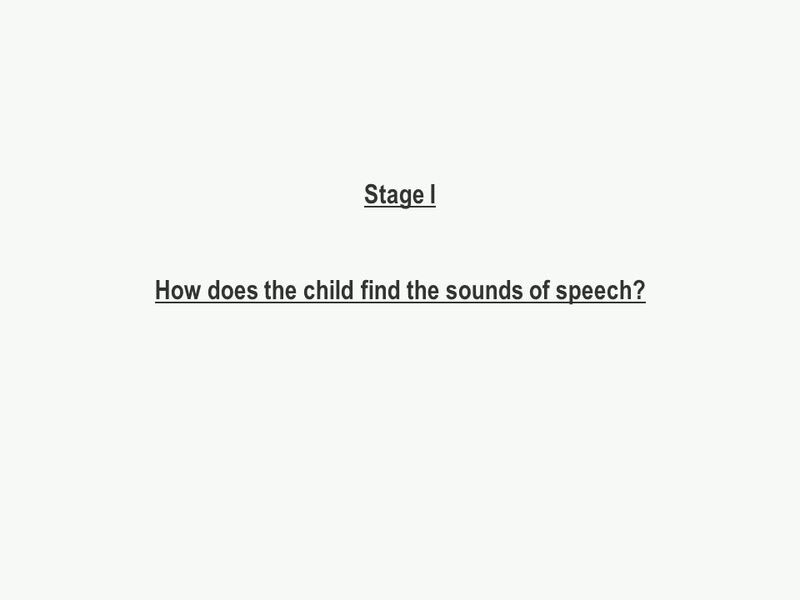 6 Stage I How does the child find the sounds of speech? 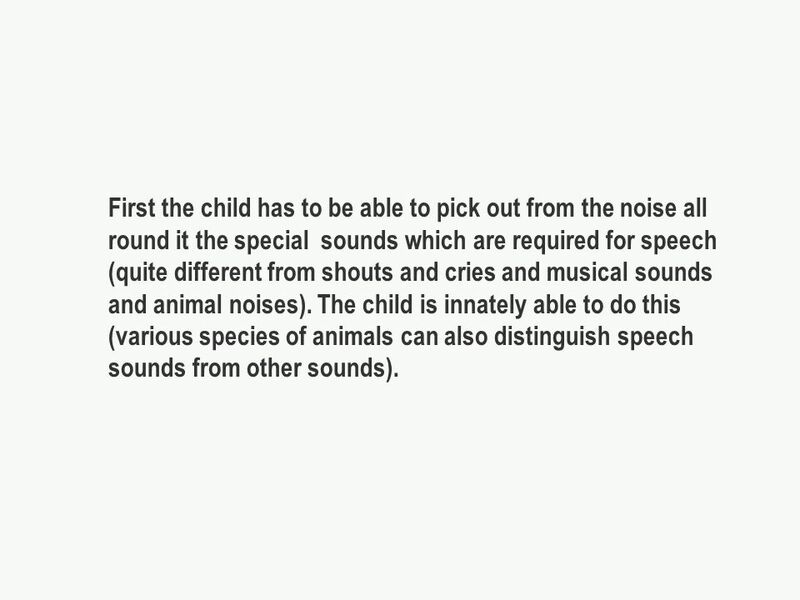 7 First the child has to be able to pick out from the noise all round it the special sounds which are required for speech (quite different from shouts and cries and musical sounds and animal noises). 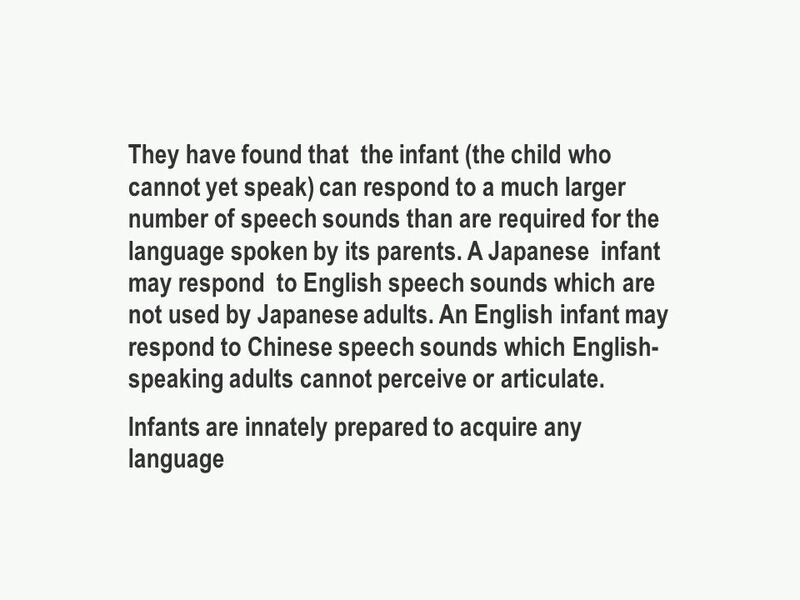 The child is innately able to do this (various species of animals can also distinguish speech sounds from other sounds). 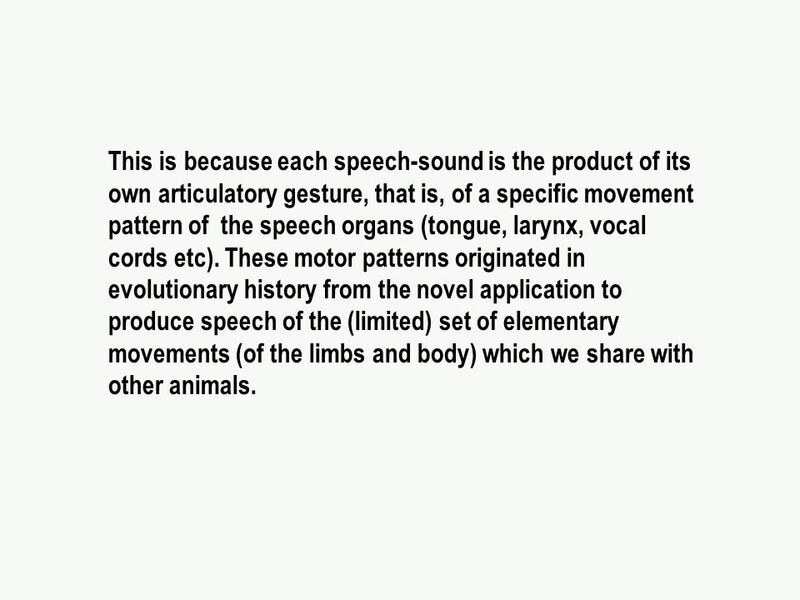 8 This is because each speech-sound is the product of its own articulatory gesture, that is, of a specific movement pattern of the speech organs (tongue, larynx, vocal cords etc). 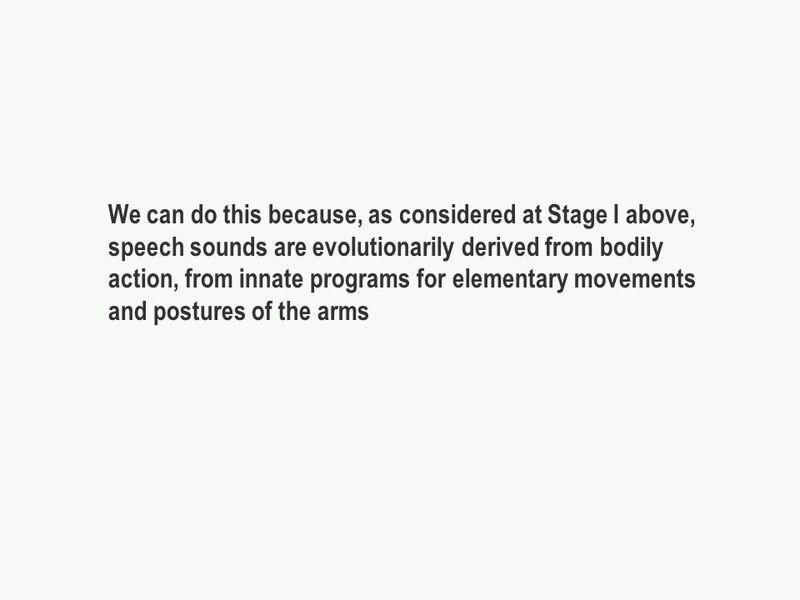 These motor patterns originated in evolutionary history from the novel application to produce speech of the (limited) set of elementary movements (of the limbs and body) which we share with other animals. 9 At birth an infant is sensitized to speech- sounds which generate neural motor programs which resonate with the innate set of elementary bodily motor programs. 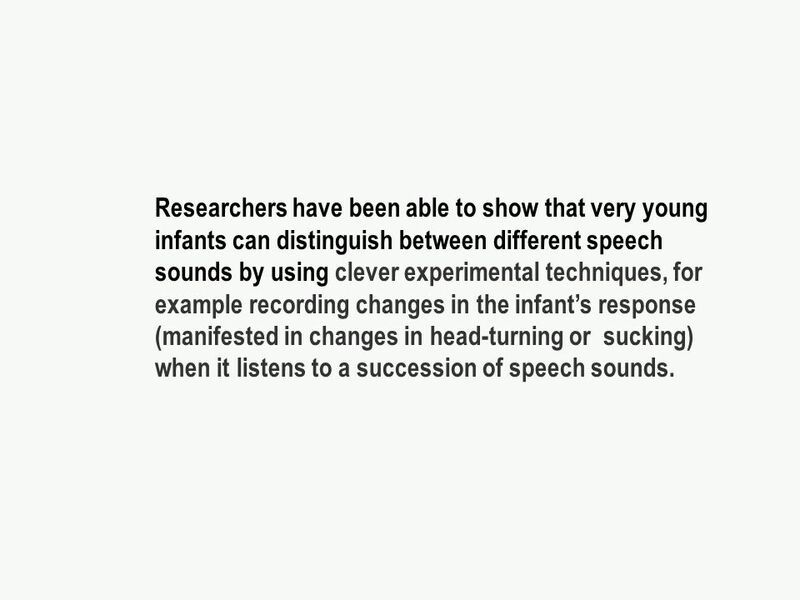 10 Researchers have been able to show that very young infants can distinguish between different speech sounds by using clever experimental techniques, for example recording changes in the infants response (manifested in changes in head-turning or sucking) when it listens to a succession of speech sounds. 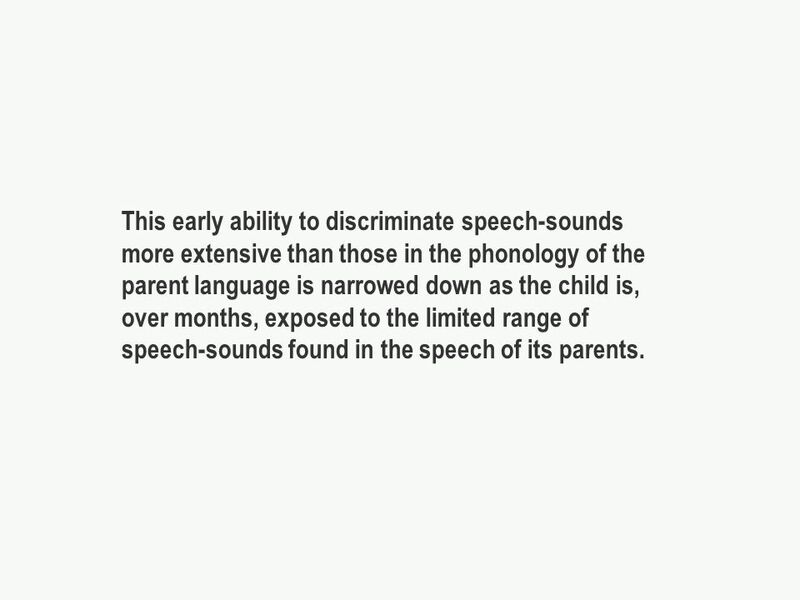 12 This early ability to discriminate speech-sounds more extensive than those in the phonology of the parent language is narrowed down as the child is, over months, exposed to the limited range of speech-sounds found in the speech of its parents. 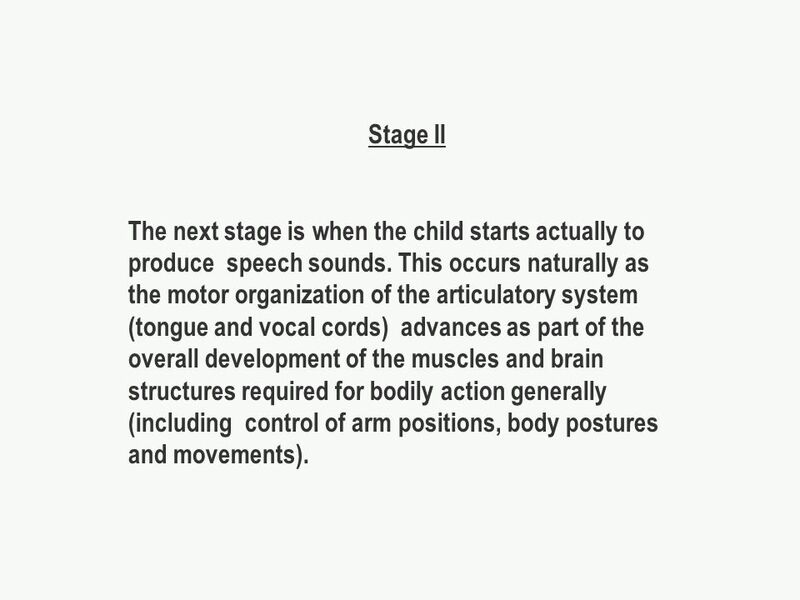 13 Stage II The next stage is when the child starts actually to produce speech sounds. This occurs naturally as the motor organization of the articulatory system (tongue and vocal cords) advances as part of the overall development of the muscles and brain structures required for bodily action generally (including control of arm positions, body postures and movements). 14 Stage III How does the child find the words ? The child has to be able to pick out the individual words of the parent language from the stream of speech to which it is exposed. To the child the sound pattern of these words will of course be unknown. There has to be a process which enables a child to latch on to each word, to discriminate one word from another. 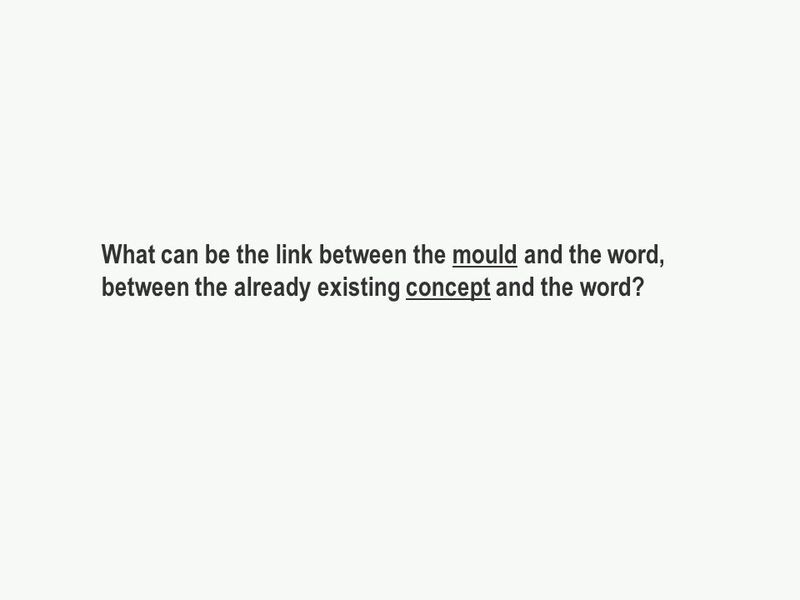 16 What can be the link between the mould and the word, between the already existing concept and the word? 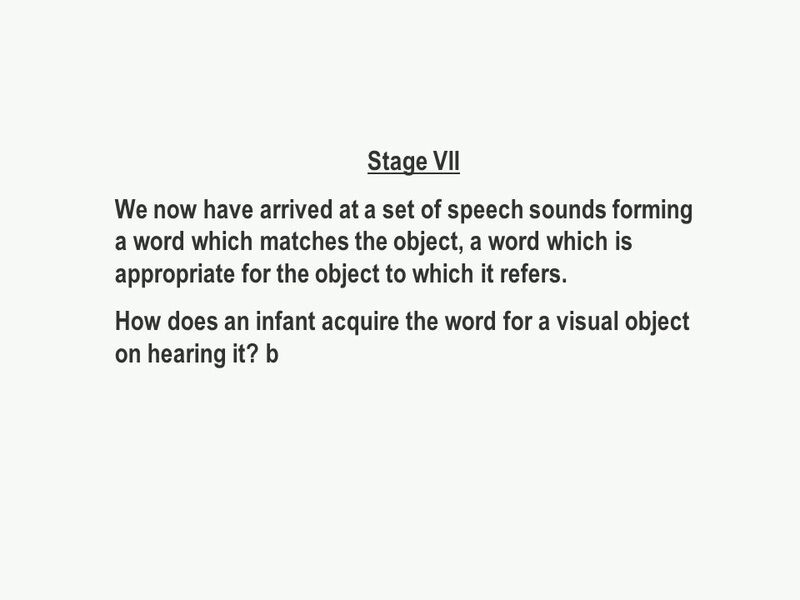 17 Stage IV How does the child find the objects and actions to which the words are to be attached? Vision is innate. Humans can recognize an object within a fraction of a second. Vision is by far the most important source for the infants growing knowledge of the world. Very young children are able to recognize more and more visual objects and show that they can see them them by reaching for them. At four months of age, they can grasp them. 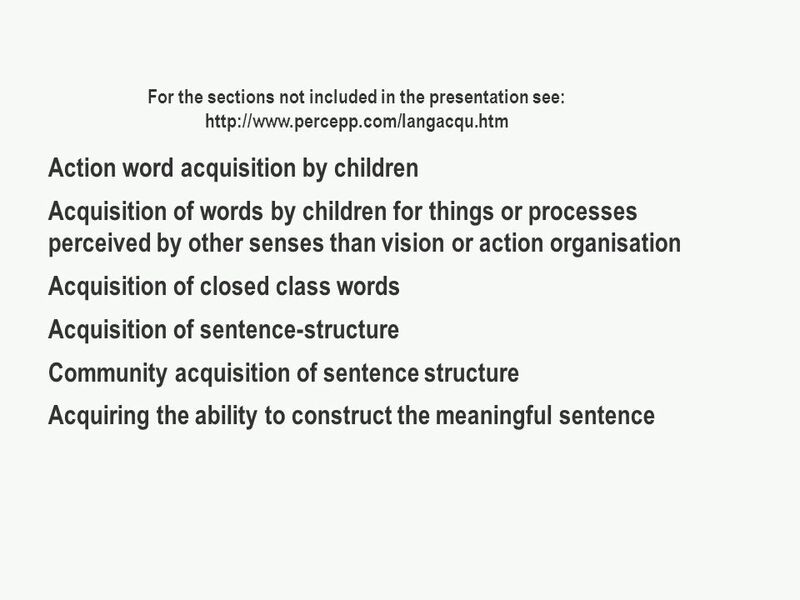 18 Stage V How can the child successfully link the word to the object or action? 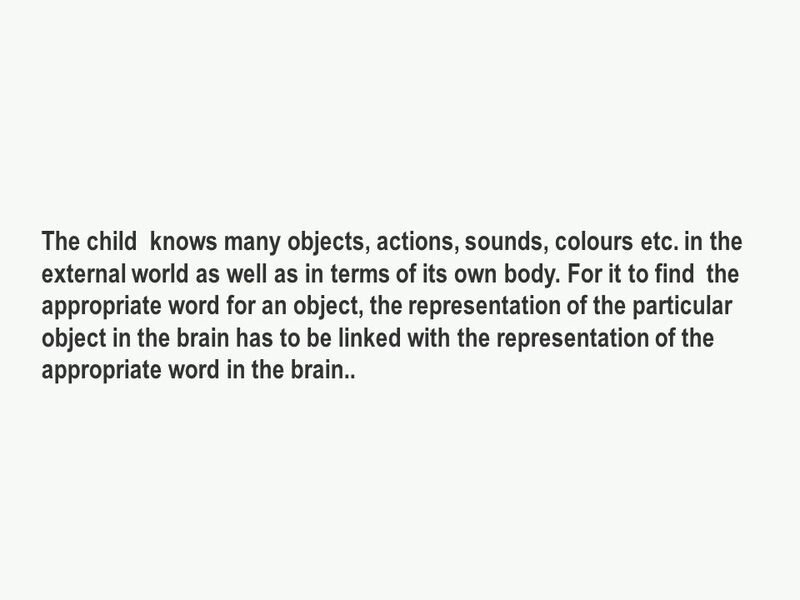 19 The child knows many objects, actions, sounds, colours etc. in the external world as well as in terms of its own body. For it to find the appropriate word for an object, the representation of the particular object in the brain has to be linked with the representation of the appropriate word in the brain..
20 There has been a lot of research into the way in which visual objects are represented in the brain and more particularly in the visual cortex, and in terms of the networks of neurons, brain-cells, associated with objects. What objects have in common is their physical form, their distinctive shapes. 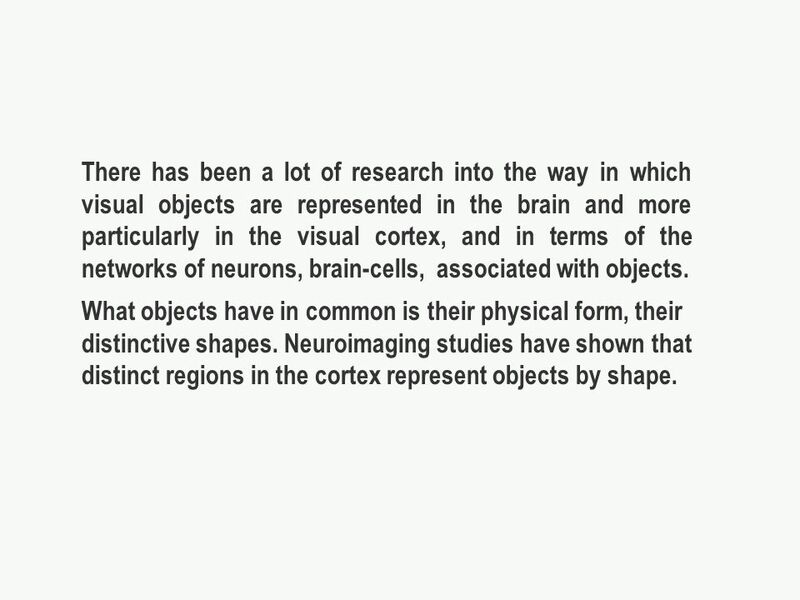 Neuroimaging studies have shown that distinct regions in the cortex represent objects by shape. 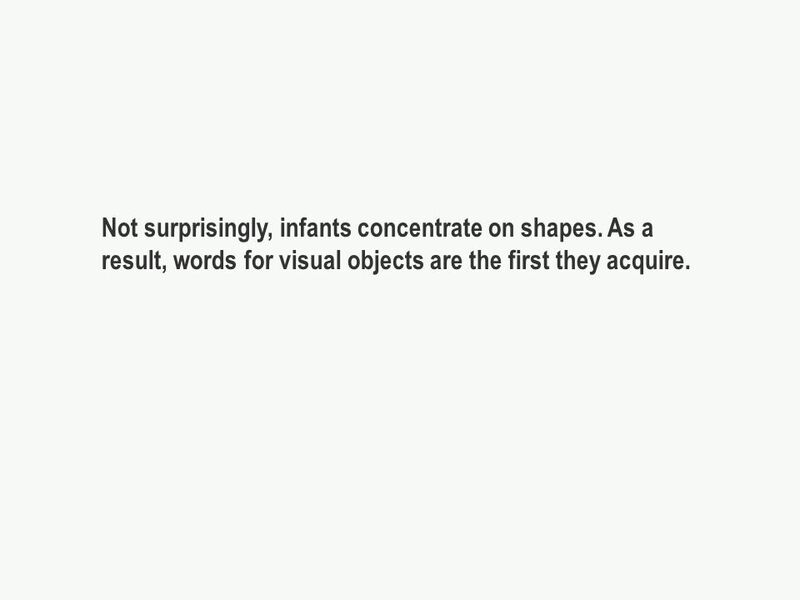 21 Not surprisingly, infants concentrate on shapes. 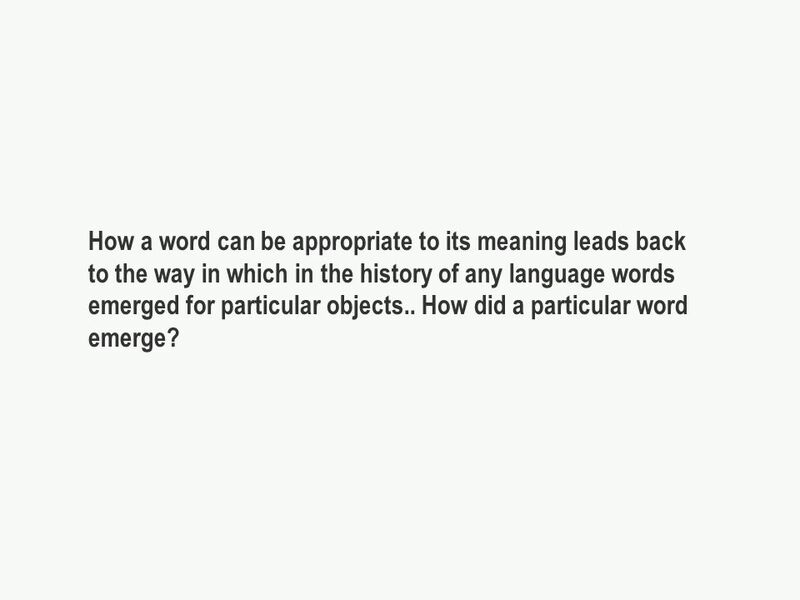 As a result, words for visual objects are the first they acquire. 22 The link between the particular object and the particular (appropriate) word comes about from the absolutely central motor character of the brains operation, its organisation to produce and control action. 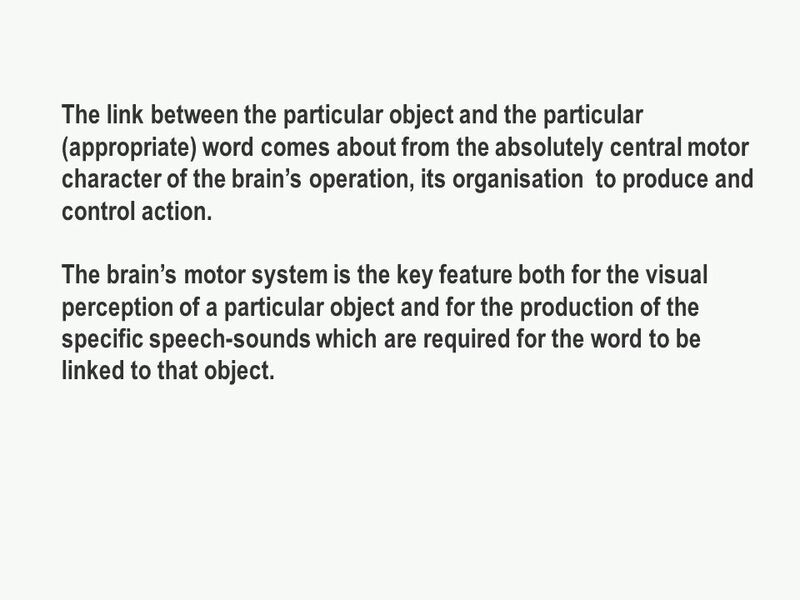 The brains motor system is the key feature both for the visual perception of a particular object and for the production of the specific speech-sounds which are required for the word to be linked to that object. 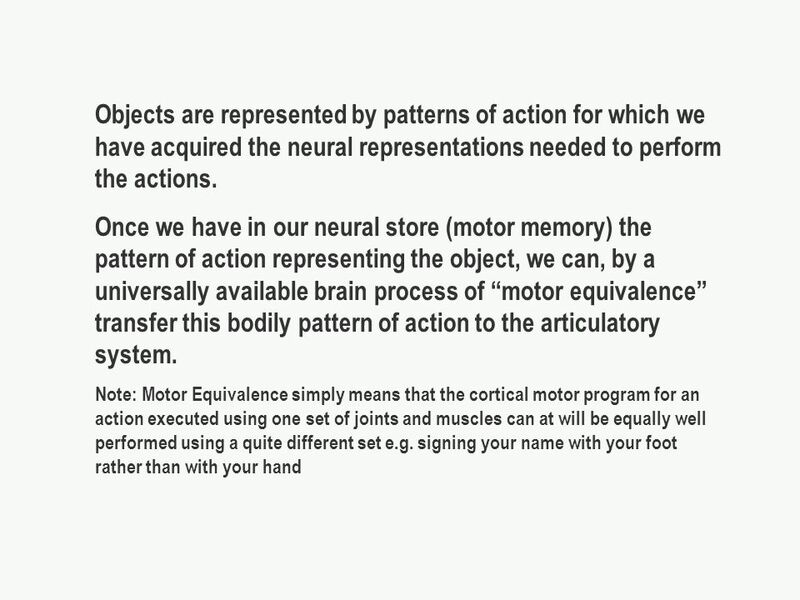 23 Visual perception of objects is a motoric process. 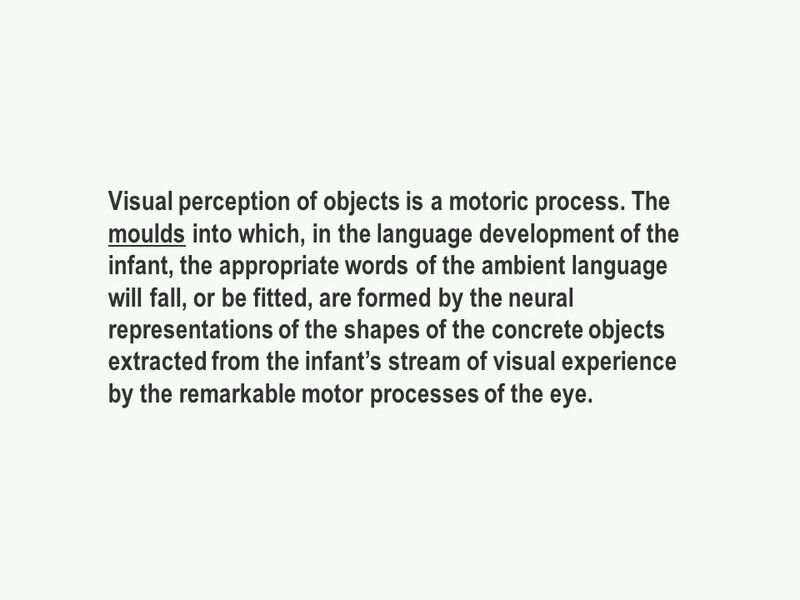 The moulds into which, in the language development of the infant, the appropriate words of the ambient language will fall, or be fitted, are formed by the neural representations of the shapes of the concrete objects extracted from the infants stream of visual experience by the remarkable motor processes of the eye. 24 The eye scans an object by a rapid succession of movements (motor commands for the eye muscles produce movement of the eye up or down, from side to side and obliquely). 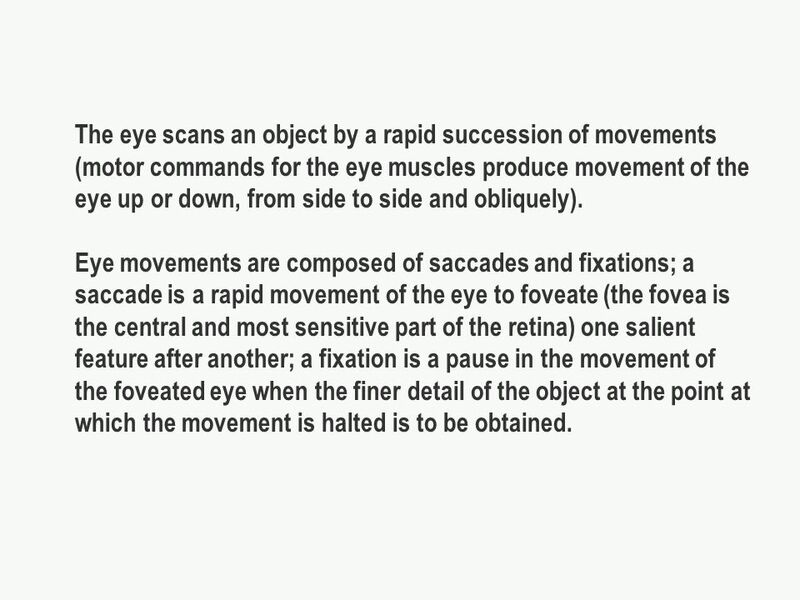 Eye movements are composed of saccades and fixations; a saccade is a rapid movement of the eye to foveate (the fovea is the central and most sensitive part of the retina) one salient feature after another; a fixation is a pause in the movement of the foveated eye when the finer detail of the object at the point at which the movement is halted is to be obtained. 25 The pattern of the actions of the eye is the result of a complicated neural system, heavily researched but not yet fully described or explained. 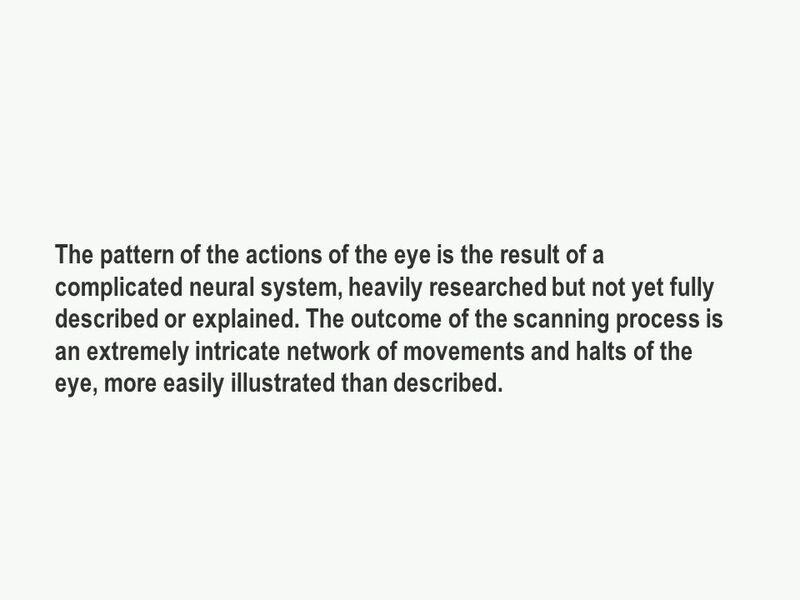 The outcome of the scanning process is an extremely intricate network of movements and halts of the eye, more easily illustrated than described. 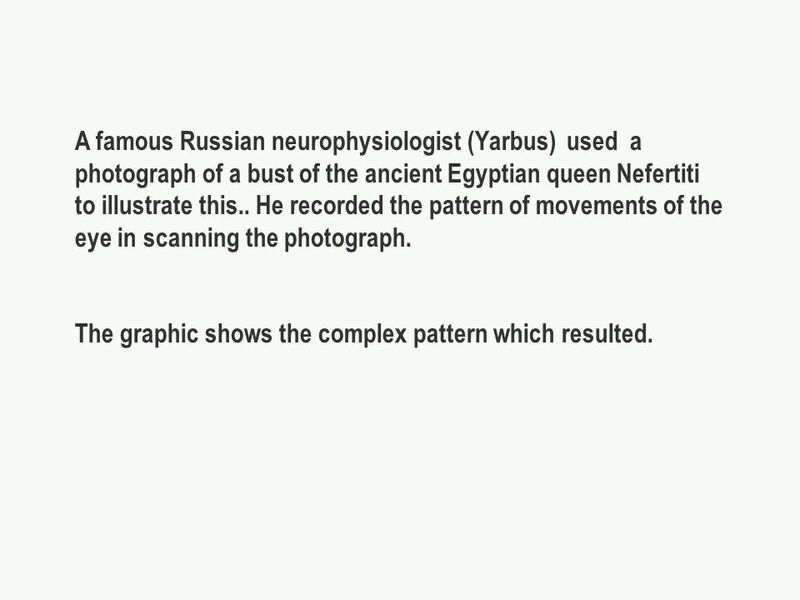 26 A famous Russian neurophysiologist (Yarbus) used a photograph of a bust of the ancient Egyptian queen Nefertiti to illustrate this.. He recorded the pattern of movements of the eye in scanning the photograph. The graphic shows the complex pattern which resulted. 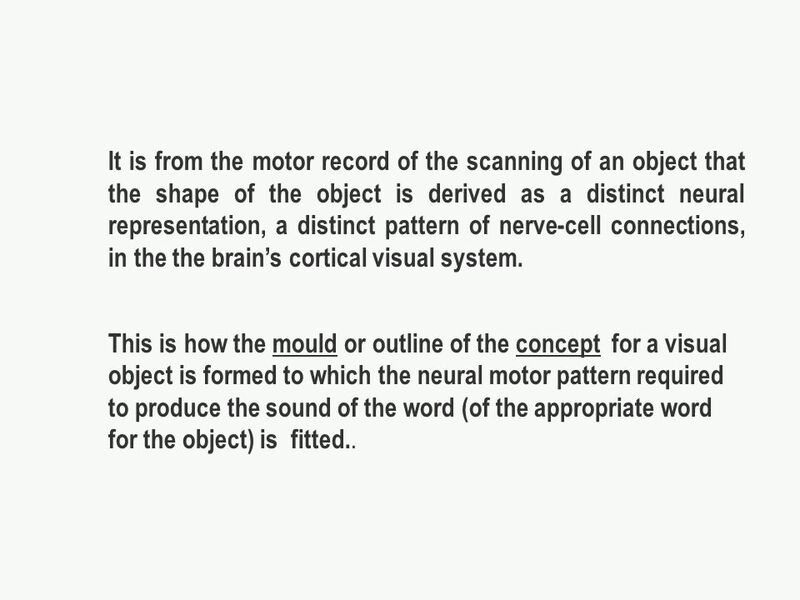 28 It is from the motor record of the scanning of an object that the shape of the object is derived as a distinct neural representation, a distinct pattern of nerve-cell connections, in the the brains cortical visual system. This is how the mould or outline of the concept for a visual object is formed to which the neural motor pattern required to produce the sound of the word (of the appropriate word for the object) is fitted..
29 Stage VI How is the appropriate word formed and found to be appropriate, in the sense of fitting into or being directly associated with the neural mould constituted by the representation of the visual object in the cortex? 30 Consider what the situation for the infant or young child is. 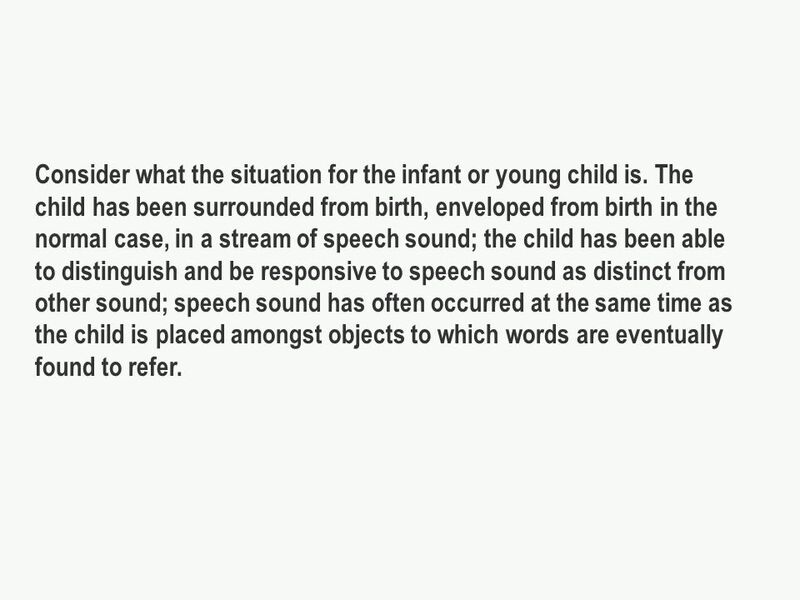 The child has been surrounded from birth, enveloped from birth in the normal case, in a stream of speech sound; the child has been able to distinguish and be responsive to speech sound as distinct from other sound; speech sound has often occurred at the same time as the child is placed amongst objects to which words are eventually found to refer. 31 This process can be taking place anywhere in the world, in any language area. In each different language area a child will be exposed to a different set of words found to be appropriate for the visual objects which the child has already acquired. 32 How can all these words in thousands of different languages, multitudes of different words for the same sets of visual object, be appropriate? 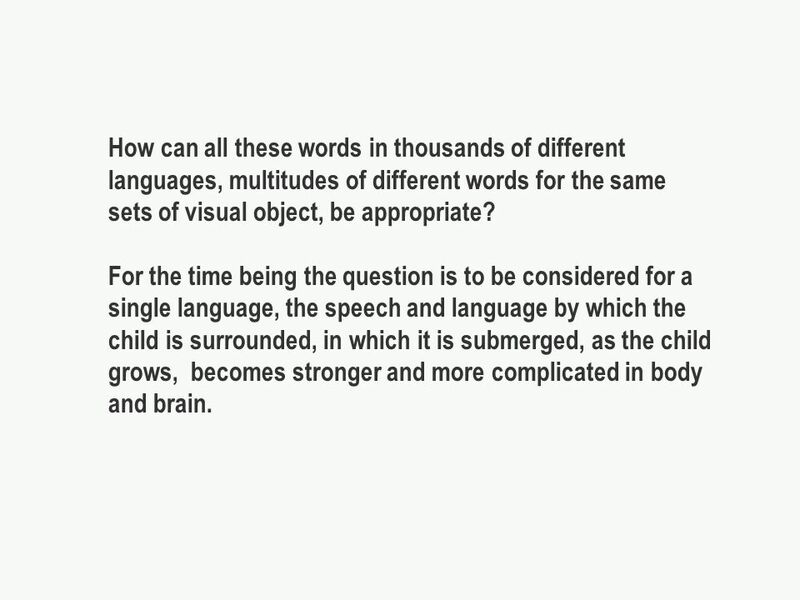 For the time being the question is to be considered for a single language, the speech and language by which the child is surrounded, in which it is submerged, as the child grows, becomes stronger and more complicated in body and brain. 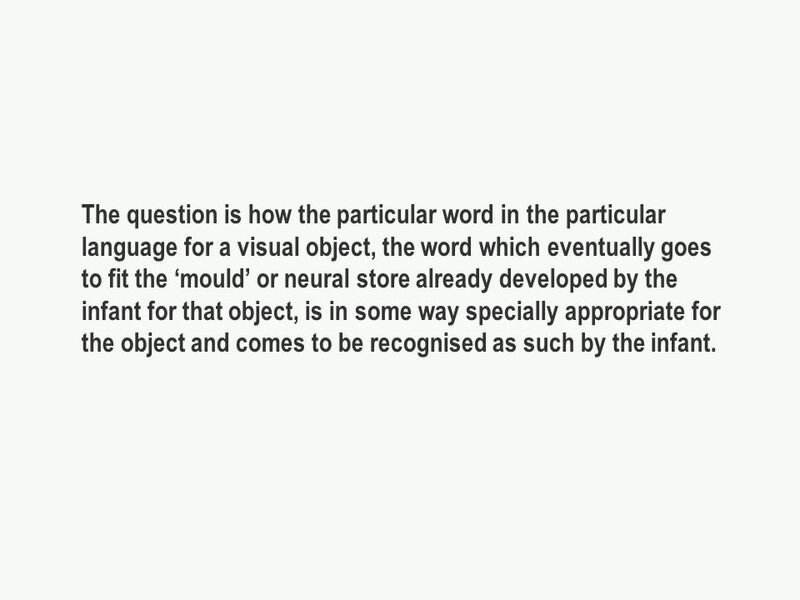 33 The question is how the particular word in the particular language for a visual object, the word which eventually goes to fit the mould or neural store already developed by the infant for that object, is in some way specially appropriate for the object and comes to be recognised as such by the infant. 34 How a word can be appropriate to its meaning leads back to the way in which in the history of any language words emerged for particular objects.. How did a particular word emerge? 35 At some stage in the history of a human group a new word emerged for the particular object. 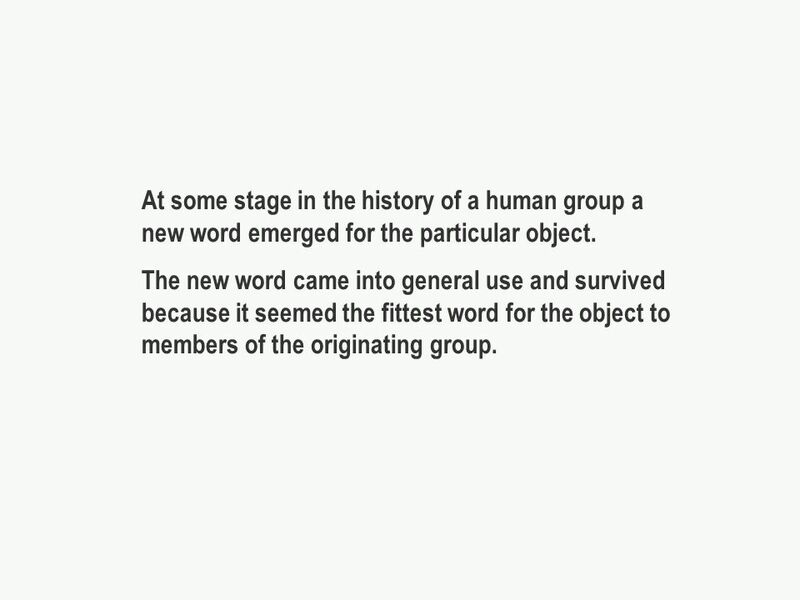 The new word came into general use and survived because it seemed the fittest word for the object to members of the originating group. 36 In what sense could a word be fit for the object to which it referred? In what sense could the word be said to match the object? Let us consider the perception of any object. 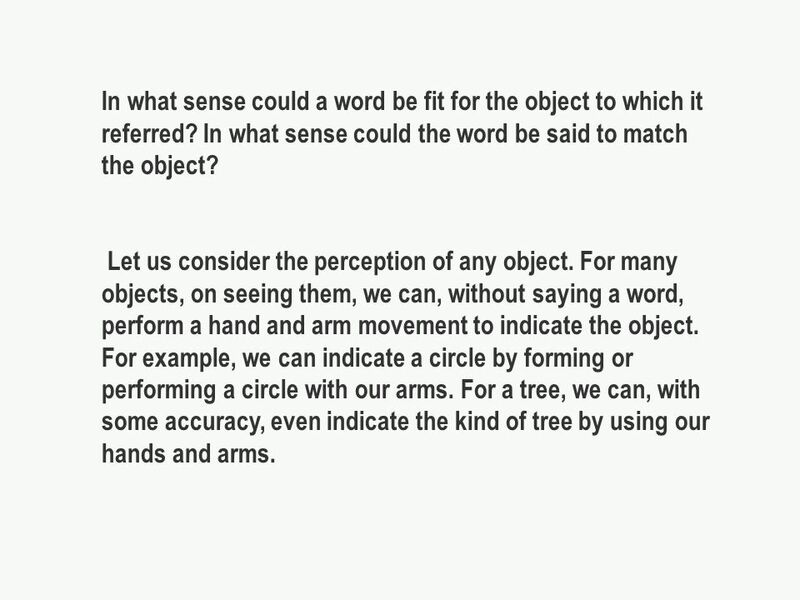 For many objects, on seeing them, we can, without saying a word, perform a hand and arm movement to indicate the object. For example, we can indicate a circle by forming or performing a circle with our arms. For a tree, we can, with some accuracy, even indicate the kind of tree by using our hands and arms. 37 We can indicate other objects by pointing. to them, to our head, our foot, our ear, our eye and so on. Homely visual objects, a bowl, a cup, a plate, can be indicated by miming the particular shape. Other items can be indicated by the appropriate contour, a step, an edge, a hill. 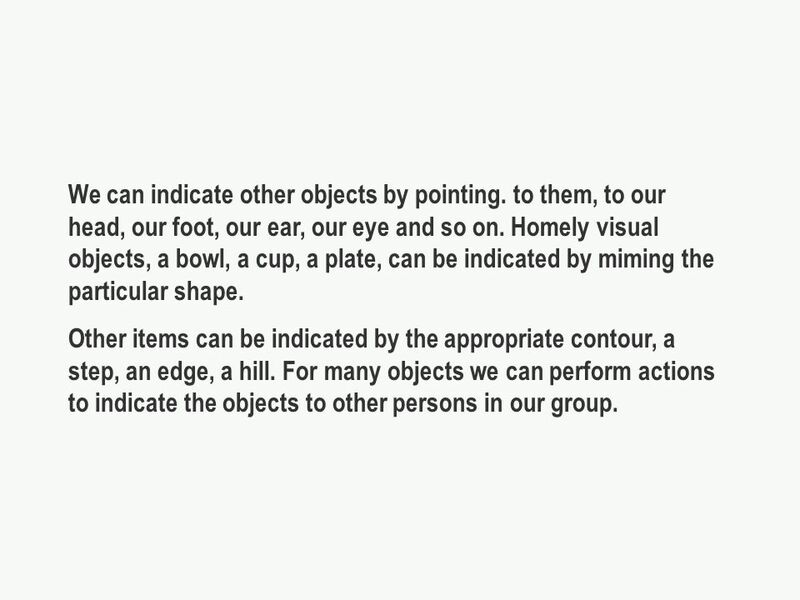 For many objects we can perform actions to indicate the objects to other persons in our group. 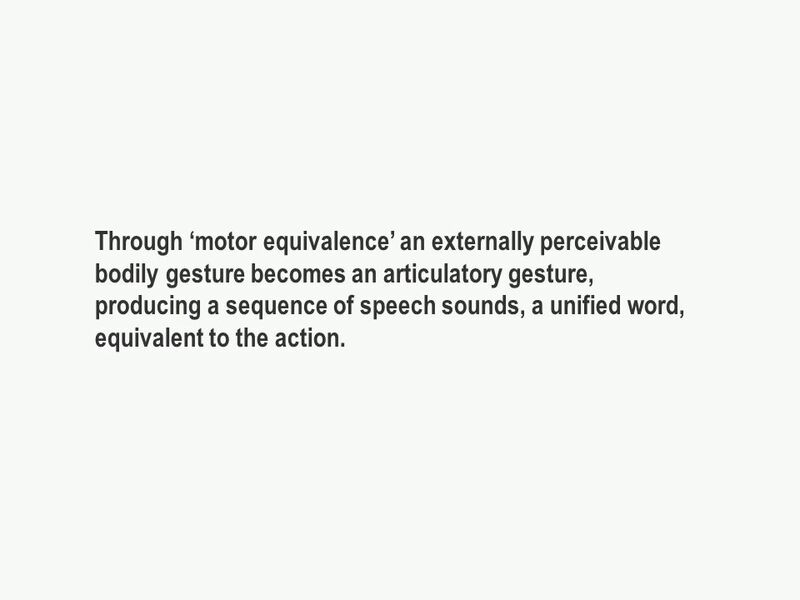 39 Through motor equivalence an externally perceivable bodily gesture becomes an articulatory gesture, producing a sequence of speech sounds, a unified word, equivalent to the action. 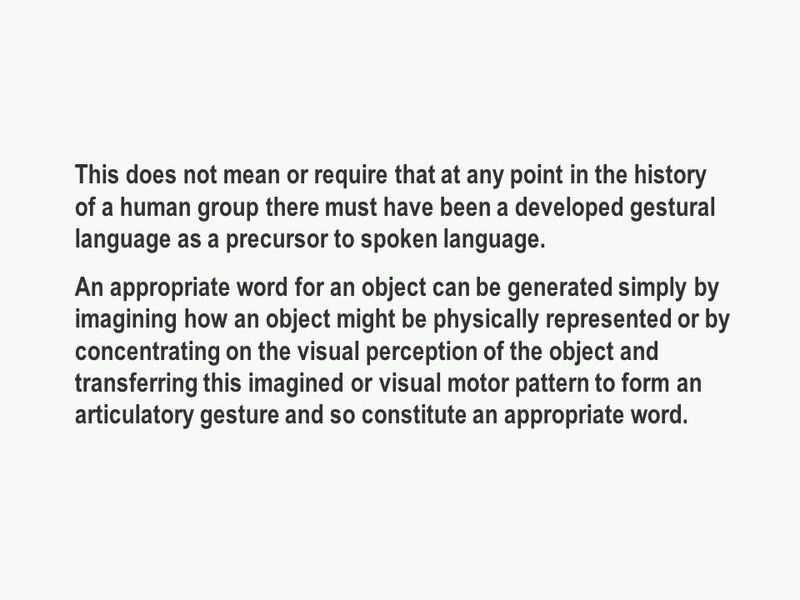 41 This does not mean or require that at any point in the history of a human group there must have been a developed gestural language as a precursor to spoken language. An appropriate word for an object can be generated simply by imagining how an object might be physically represented or by concentrating on the visual perception of the object and transferring this imagined or visual motor pattern to form an articulatory gesture and so constitute an appropriate word. 43 From the motor theory of speech perception (Haskins Laboratories), the hearing of a word by an adult is perceived in terms of the motor program required to produce the word. The word is cross-modally transformed into the articulatory motor program for producing the word. 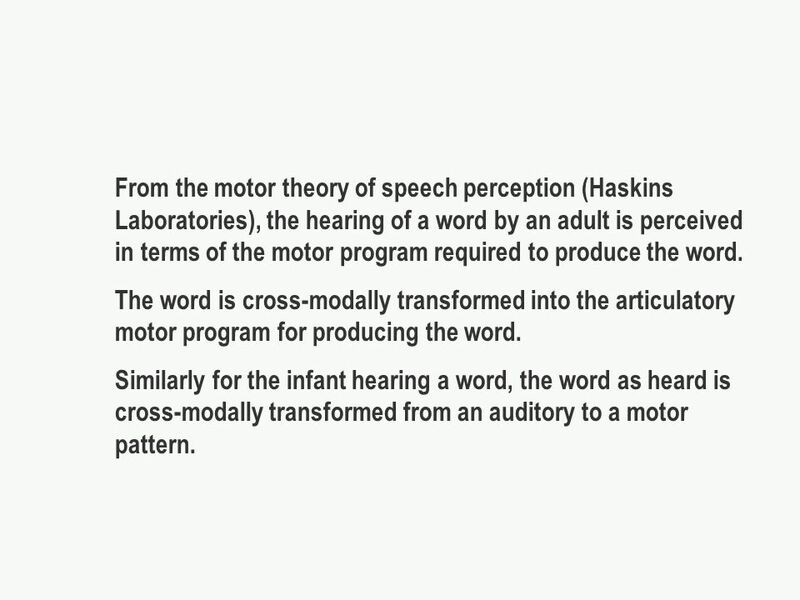 Similarly for the infant hearing a word, the word as heard is cross-modally transformed from an auditory to a motor pattern. 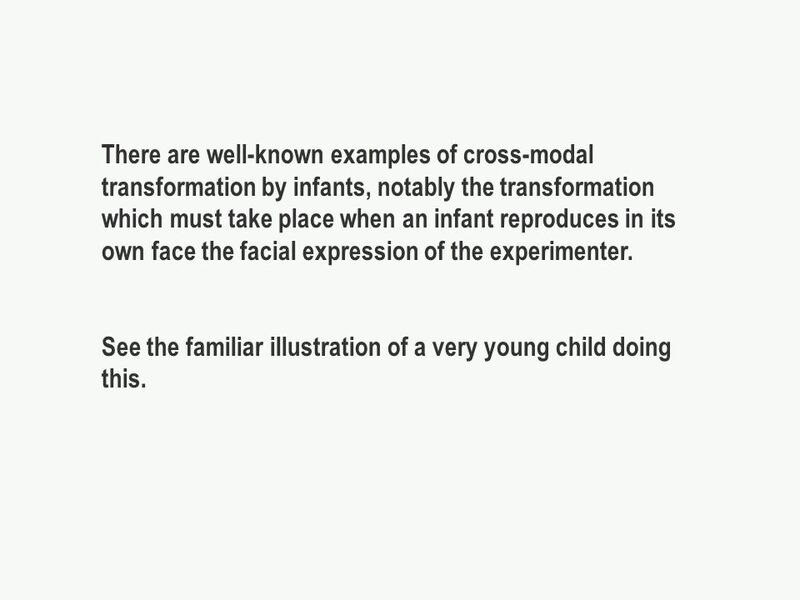 44 There are well-known examples of cross-modal transformation by infants, notably the transformation which must take place when an infant reproduces in its own face the facial expression of the experimenter. See the familiar illustration of a very young child doing this. 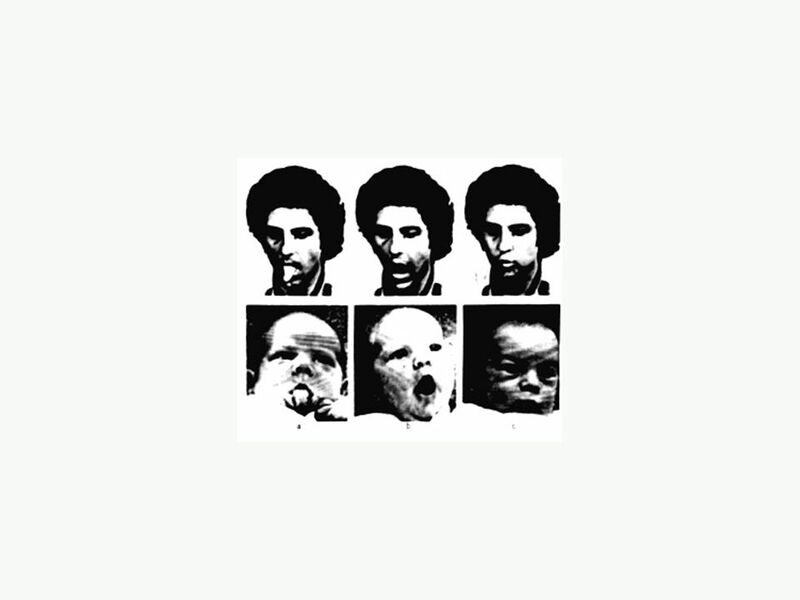 46 The infant in this series of experiments saw and reacted to the different patterns of the experimenters face. It did this by using its eyes to scan the differing facial shapes. 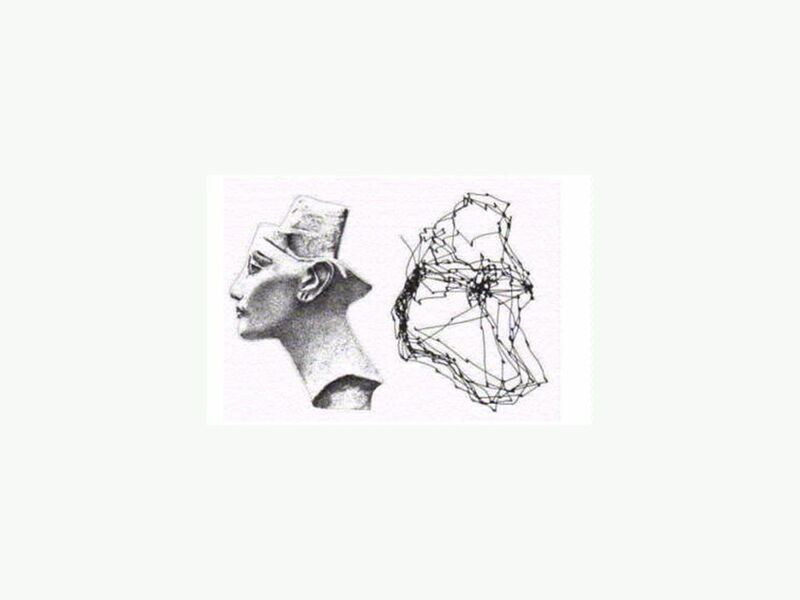 From these rapid scans the infants brain constructed motor representations, distinct neural network patterns, which matched, were appropriate for, the different facial shapes. 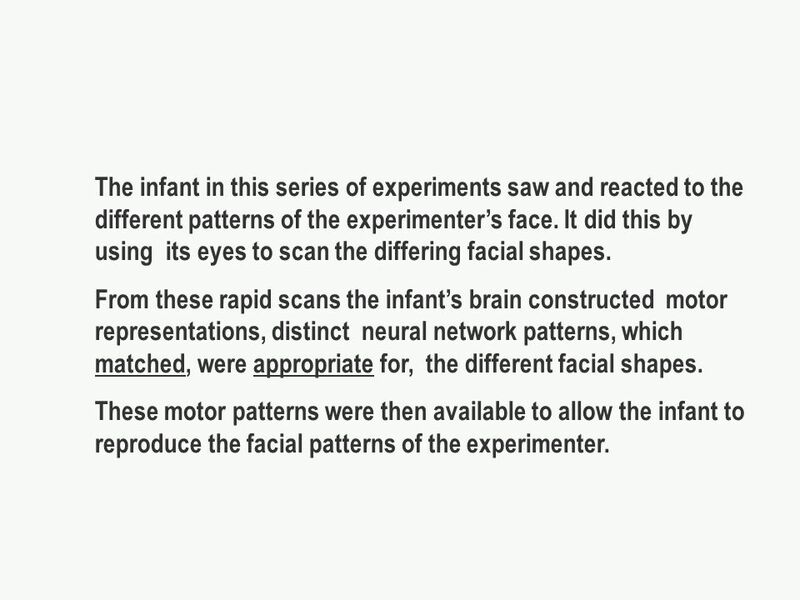 These motor patterns were then available to allow the infant to reproduce the facial patterns of the experimenter. 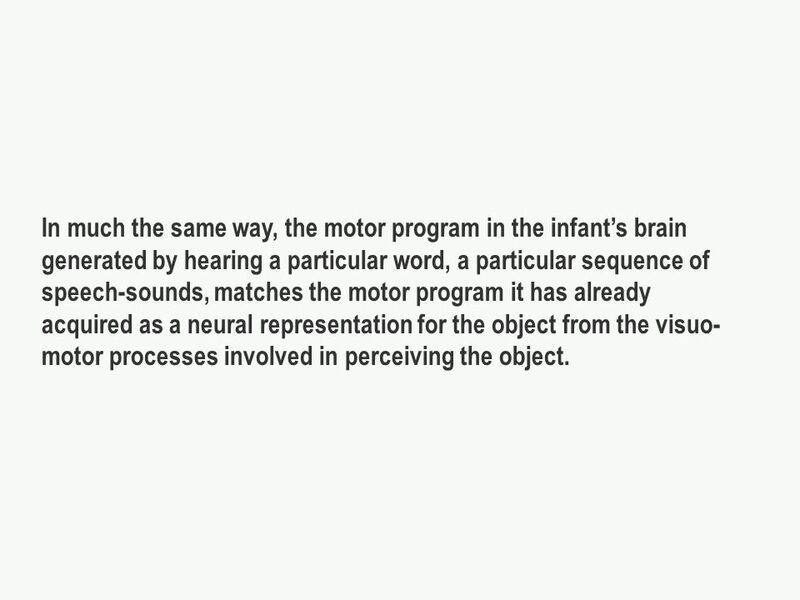 47 In much the same way, the motor program in the infants brain generated by hearing a particular word, a particular sequence of speech-sounds, matches the motor program it has already acquired as a neural representation for the object from the visuo- motor processes involved in perceiving the object. 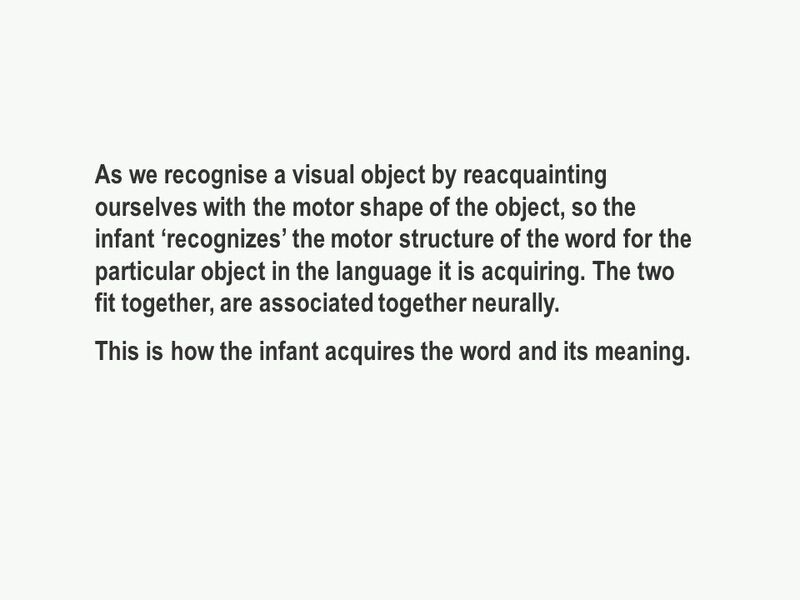 48 As we recognise a visual object by reacquainting ourselves with the motor shape of the object, so the infant recognizes the motor structure of the word for the particular object in the language it is acquiring. The two fit together, are associated together neurally. This is how the infant acquires the word and its meaning. 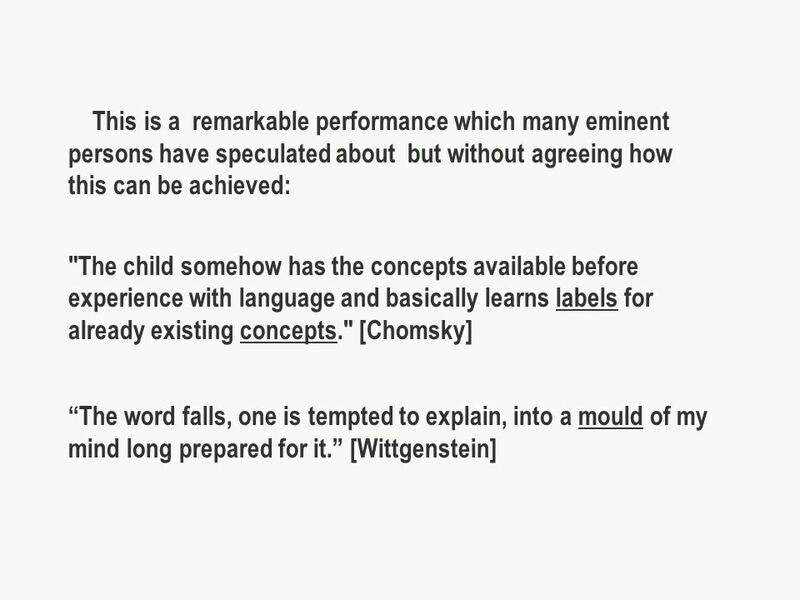 49 In Wittgensteins terms, the word when heard by the infant falls into the mould constituted by the neural representation of the object. 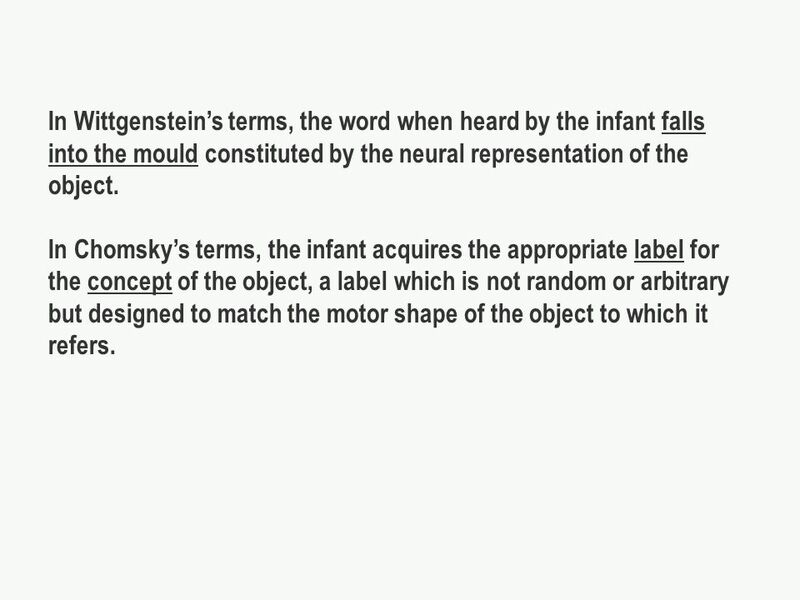 In Chomskys terms, the infant acquires the appropriate label for the concept of the object, a label which is not random or arbitrary but designed to match the motor shape of the object to which it refers. 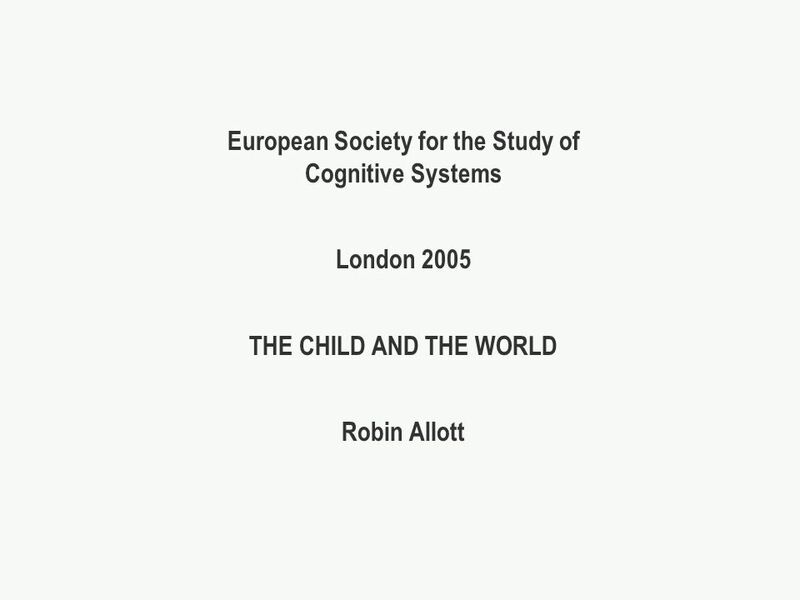 Download ppt "European Society for the Study of Cognitive Systems London 2005 THE CHILD AND THE WORLD Robin Allott."  Employed to develop french versions of questions on english intelligence tests  Became intrigued with the reasons children gave for wrong answers. Are you thinking what I’m thinking?. Choose a card and remember it Mind-reading? 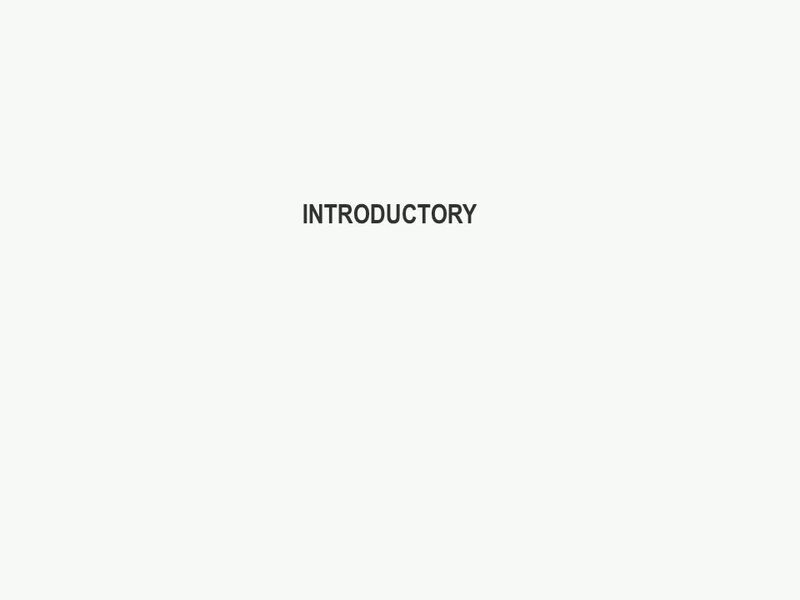 Chapter 12 Speech Perception. Animals use sound to communicate in many ways Bird calls Bird calls Whale calls Whale calls Baboons shrieks Baboons shrieks. Psikologi Anak Pertemuan 3 Motor, Sensory, and Perceptual Development. Bruner’s Approach Objectives: Outline Bruner’s concept of scaffolding. CSD 2230 HUMAN COMMUNICATION DISORDERS Topic 2 Normal Communication Development and Communication Across the Lifespan.